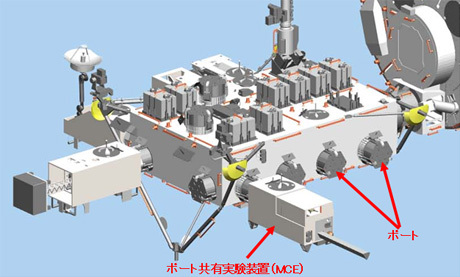 JAXA has developed a Multi-mission Consolidated Equipment (MCE), as a series of the Exposed Facility (EF) experiments for the Kibo Second Phase Utilization. Kibo's EF has several ports called the Exposed Facility Units (EFU) which connect payloads with the EF. MCE is a conglomeration of five small mission payloads that perform experiment or observation to facilitate an effective use of the port. So far, four experiment-payloads have been installed to EF, Space Environment Data Acquisition equipment (SEDA-AP), Monitor of All-sky X-ray Image (MAXI), Superconducting Submillimeter-Wave Limb-Emission Sounder (SMILES), and NASA's HICO and RAIDS Experiment Payload (HREP). Each payload has one mission, SEDA-AP measures space environment; MAXI monitors all-sky x-ray, and SMILES observes ozone depleting substance, while MCE is a consolidated payload consists of independent five missions. This enables us to perform various missions using just one port. MCE on orbit is found behind astronaut Hoshide performing spacewalk. MCE was launched on July 21, 2012, aboard the H-II Transfer Vehicle KOUNOTORI3 (HTV3 mission) and installed to the EP on August 9, 2012. Onboard five mission payloads listed below are all selected missions thorough deliberation and evaluation by the ISS/JEM Utilization Advisory Committee and JEM-FE sub-committee. Mission summary SIMPLE collects fundamental engineering data on orbit by exposing the inflatable structure (an ultralight structure which can be inflated by a rise in the internal pressure with gas) in the space environment for a long term. Mission summary Validate robot's spatial migration and working function inevitable for robots to support astronauts' extravehicular activity (EVA) using a robot with extended arm and tether. Mission summary The mission uses the commercial-off-the-shelf camcorder to assess if it survives under the exposed environment, recording its just beneath Earth surface (covering 200km x 350km) from an altitude of 400 km.